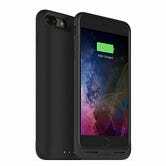 Mophie’s Juice Pack Air adds a 2,420mAh rechargeable battery, wireless charging, protection, and compatibility with an ecosystem of magnetic accessories to your iPhone 7 or iPhone 7 Plus. It’s awesome. Update 7/16/17: Now available for Galaxy S8/S8+. Right off the bat, you’ll notice that the Juice Pack Air’s snap-together design makes it easy to put on and take off at will. I recently checked out a case that had to be screwed on and off, and another that I snapped in half the first time I tried to remove it. The Juice Pack is the first battery case I’ve ever put on a phone, and since I’ve never owned an Android, the first time I’ve had access to wireless charging or charging over micro USB. Traveling with no proprietary Apple charging cables for the first time since iPods was bizarre. The battery in the iPhone 7 Plus is 2900mAh, so attaching the Juice Pack should just about double whatever battery life you’re used to getting. After fully charging both the phone and the pack, and without making any changes to my routine or efforts to conserve battery, I was able to go from Wednesday morning to Friday evening without plugging in. The Juice Pack has been amazing for days of long flights, and could definitely be used to take a weekend trip with no cables. 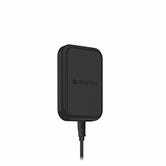 The Juice Pack is compatible with the wireless charging pads you already own, but it should come as no surprise that Mophie designed their own as well. 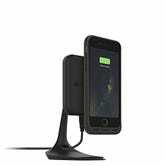 While it would get very expensive very quickly to fully outfit your life with Mophie’s Charge Force accessories, they’re pretty damn cool, especially the desk mount. The Juice Pack Air is available in five colors with a two year warranty.